. 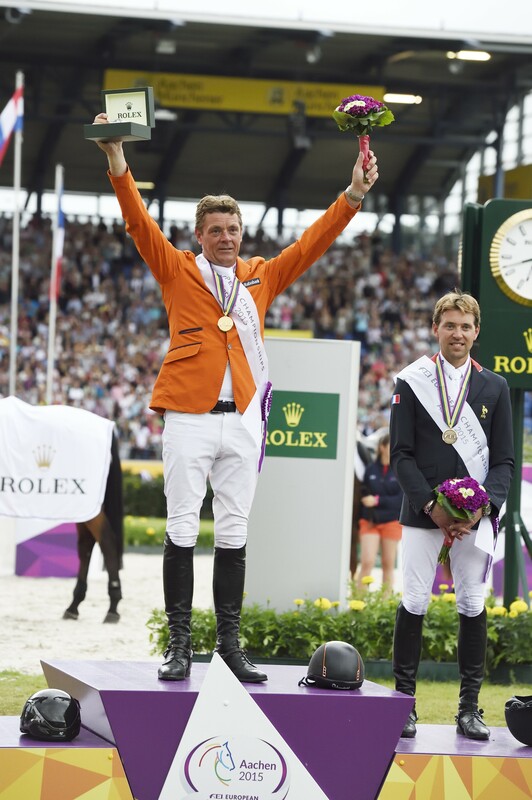 :: JEROEN DUBBELDAM WINS GOLD AT THE FEI EUROPEAN CHAMPIONSHIPS IN AACHEN. NOW HOLDS WORLD AND EUROPEAN TITLES CONCURRENTLY. ::. >> JEROEN DUBBELDAM WINS GOLD AT THE FEI EUROPEAN CHAMPIONSHIPS IN AACHEN. NOW HOLDS WORLD AND EUROPEAN TITLES CONCURRENTLY. In overcast, mild weather conditions, which were perfect for show jumping, the FEI European Championships closed with one of the finest displays of horsemanship the sport has seen in decades. At the end of five rounds of competition, Jeroen Dubbeldam from the Netherlands, riding SFN Zenith N.O.P. proved that he really is the best in the world when he added the European gold medal to his World Championship title that he won at the World Equestrian Games in Normandy in 2014. Jeroen Dubbeldam is now the first rider in 24 years to hold both Individual World and European Jumping titles concurrently. The 40,000 crowd who packed the seats and standing space around the remarkable Aachen arena on the final day were lucky enough to watch equestrian sports at the highest level. The first round of the Individual final saw five clear rounds from the 25 combinations, which left the final medal placings wide open going into the last stage of the competition. Of the Top Four riders, only Spain's Sergio Alvarez Moya had a pole down, which dropped him out of the medal contention. Despite a time fault, France's Simon Delestre replaced Moya in the bronze medal position and when Gregory Wathelet from Belgium went clear into silver, Jeroen Dubbeldam entered the arena knowing that, although he could afford a time penalty, just one pole down would cost him the European title. Speaking about his victory, Jeroen Dubbeldam said, "If you go here to Aachen, one of the most difficult places you can have a championship and one of the nicest, then you know it is going to be a tough battle. So many good riders and so many good horses, you can only dream that it comes true - there's no wisdom for it and you have to be also, of course, a little bit lucky. First of all, everything needs to be, of course, good, you know horses have to be fit and you have to be fit and you have to focus and everything, but in the end you also need a little bit of luck and I had the luck also on my side and this is a dream coming true." Acknowledged as the world's finest equestrian venue, Aachen has staged a highly successful FEI European Championships which attracted over 300 horses and 1,000 competitors who took part in five European competitions including Jumping, Dressage, Reining, Vaulting and Driving. Always a popular venue with equestrian fans, over 369,000 spectators flooded into the showground over the 11 days of intense competition. "I am just really, really happy, it's all good, my horse jumped amazing and today was again double clear, I have nothing to say - it was just amazing all the week. I knew I had to be clear otherwise I was out of the podium and I didn't ride my best one, for sure the last one, I was not smooth enough and relaxed enough, but ok, it's the final and for sure you have to think about one thing - be clear and not maybe about the style and everything, but at the end, the results are there, because I am second at the European Championship. My first medal at a big championship." "Ryan is just incredible, he's a fantastic horse, it's been an amazing week this week and with a double clear today, it was something incredible and it's fantastic for me. It's a reflection of, I think, the season. Ryan has had an incredible season, all this season - with Classic also - are really in good form. It's a nice period for me and when you have big confidence in your horse and in yourself, it's always more easy and today was amazing."